Veteran journalist Zainuddin Maidin has lashed out at the Malaysian Communication and Multimedia Commission for not taking action against the Malaysian Insider. He said in his latest blog that even though Mukhriz has accepted the Insider's apology, that's not an excuse for MCMC to NOT act. ".. clear malicious conspiracy against Mukhriz using the (cyberspace)," Zam writes. The Commission, he says, seems to be playing it safe (politically) or trying to be popular. Read Penyokong2 Mukhriz mesti buktikan kelemahan MCMC. 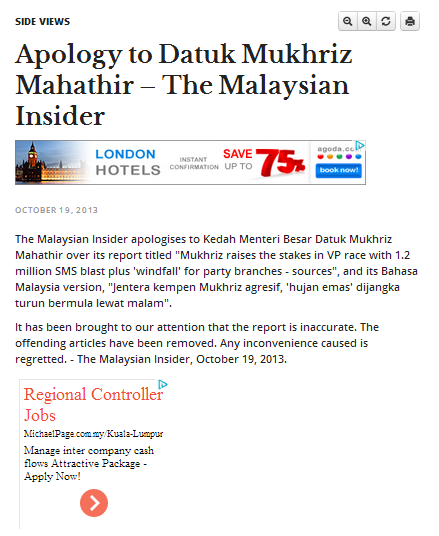 Why did the Malaysian Insider publish that dubious report about Mukhriz Mahathir, knowing very well that it was so dubious it couldn't be true and that, because it's so clearly so defamatory, it would have to issue an apology or face a lawsuit? In Kenapa Mukhriz boleh jadi mangsa fitnah?, influential blogger Helen Ang says it is because Mukhriz has become a major threat to many people, inside and outside UMNO, including Khairy Jamaluddin. Pro-UMNO blogger Big Dog, describing the Insider as a pro-Opposition, "Riong Kali's" portal, says the malicious attack on Mukhriz to "smear his good name and clean image" was expected "since Mukhriz's popularity among the UMNO grassroots increases by the day, across the board". Read Here comes the dirty trick (the blogger attaches the Insider's offending article Mukhriz's raises the stake with .."windfall" for party branches - Sources). Me, I think it reflects on the professionalism and ethics of today's online journalism. I think the Malaysian Insider editor concerned did it because he/she reckoned the portal would get away with it, like they'd gotten away many times before. I mean, look at the apology - how blasé! How sincere is the apology when you removed the "offending articles" but not the disparaging comments by readers (who were responding to the erroneous original article), and when you still proudly displays the article under your "Most Read" section? It is time for individuals politicians or otherwise to take on the menace of the likes of former Wall Street Journal journalist parading as the Malaysian Insider. He is not alone. The many drunks in street rags and scandal sheets who also engage in this blood sport ought to be brought to book. About time individuals at the receiving end of these so called journals and journalists exercised their own rights under the law to defend themselves against scurrilous and defamatory personal attacks. The torch has now to be turned on the bellies of these cowards who have thus far relied on the patience of the many they scandalously defame in the name of unfettered free journalism. They who claim to act under that so called "absolute" right to free speech which does not exist. At the top of this list are those so called opposition (without a mandate) bloggers and reporters whose very liberal use of the pen has brought the real right to responsible free speech into disrepute. Ït's been brought to our attention that the report is inaccurate. The report is f.a.l.s.e. Not inaccurate. Another round of crap from MI. And to anon 2.20pm, which lies are u referring to? That over 90% chinks voted gleefully for da(p)kr in the last PRU13? Bolo..
Mukhriz should have sued. Insider is the worst. You of all People are Like the Pot Calling The Kettle Black! Interesting to see if you will display this too. Rocky, why no comments when Utusan spreads worse news than Malaysian Insider?? Selective memory???? If tak spin bukan Malaysian Insider namanya. Not surprising anymore. Nothing is too low for them to stoop to. TMI need not worried now as Mukhriz ride off into the sunset after tonite. Look who is talking about professionalism and ethics of online journalism. You literally lack non. What kind of good name or image has he got ? He is lucky even to be a MB in Kedah for now and should thank Najib for that compassion, to keep as far away as possible from the rest of Malaysia..He should stay and rot and decay there, from dust he came and to dust he should return, haven't you heard of that ? Firstly I doubt this sort of report would have much impact within UMNO voters as I doubt many read the Insider. Mukhriz seemed a decent fellow who has spent his time quietly getting on with things with no ego attached. Despite his father's background he has shown a bit of independence and thought. The sort of person that could rejuvenate UMNO. Now all UMNO has are ego driven leaders who have not delivered anything. Charleskiwi has a point. Let this election be a wakeup call to Mukhriz. Be honest with himself and ask himself if he is really up to it. Its not just about being a political King in Kedah. even that will prove to be a mirage when he loses in the coming byelection. This isn't about being comfortable as YB MB... Its about making progress for the state and keeping the opposition at Bay! And that is hard work and nobody is going to do that for him...Especially those whose position he stole after the last election. UMNO leaders shd be tough dealing with false reports like this. It not only damaging the reputation but also misleading. How are the rakyat gonna judge whether a leader did something bad or not if no one take actions?And this will just spread lies and fitnahs. It is the leaders duty to stop these speculations as Islam prevent such things. Fitnah itu dosa...and yg berdosa adalah rakyat jugak when they too start spreading the rumours. Form a new party Datuk Mukhriz. I'm a good Malay Malaysian. I'll support you. ( Does Malay Malaysian sound racist? Well its intentional. In the last 15 years, Malaysians have become very racially polarised - by choice. I used to be very liberal. Now its like, don't mess with me ). One reply here says as stated below. I read it again, replacing UMNO with DAP and then PAS and then PKR. UMNO leaders shd be tough dealing with false reports like this. It not only damaging the reputation but also misleading. How are the rakyat gonna judge whether a leader did something bad or not if no one take actions? And this will just spread lies and fitnahs. It is the leaders duty to stop these speculations as Islam prevent such things. Fitnah itu dosa...and yg berdosa adalah rakyat jugak when they too start spreading the rumours. Utusan reports definitely reports more truth than the opp papers which have the habit of spreading fitnah. Same like their boss raja fitnah botox bapok tua. Lidah tu tak lama tumboh kudis. 40000 bangla konon lahad datu penyelamat mati d kelar d korek biji mata mr botox pelacur agama bangsa boleh berjoget mcm badut atas pentas. Apa tu? Lahanat. Tolongkop la raja fitnah d dunia lagi. Balasan akhirat menanti. Anak beranak biadap. Tidak selective la MI mmg hobbynya buat fitnah. Lagi bagus jika name akbar mereka tukar kpd MS. Malaysian slanderer.!!!!!! We are so happy that the Mukhriz has lost his bid to be one of UMNO vice-president. Congratulation to party for re-electing Youth chief Khairy Jamaluddin. Compare to Khairy and Mukhriz, YB Khairy is our best bet for future PM of Malaysia. I'm fed-up with UMNO already. I sure hope that UMNO supporters in Sg. Limau could give it a pass, on nomination day. It does not matter anymore if PAS retain that seat. Its not that BN would achieve 2/3, anyway. Could even save Rakyat's money. No more ceramah and campaign which will divide the Malays further. Kedah MB have tossed the idea of an EXCO slot to PAS, as a goodwill? Wonder what happen to that idea. A win for PAS, bodes well as a starter, though. Come GE14, I hope PAS could quit PR and get rid of those Anwaristas among them. Frustrated UMNO supporters would then have a better option rather than those tainted and corrupted millionaires being appointed, again and again. It is because Utusan is a main stream papers like NST, Berta Harian, Kosmo and many others and that Roket and Harakah are both suara politik pembangkang.Hell with Roket and Harakah..
Mukhriz on the other hand brings the image of botakness, places like Jerlun, Air Hitam, courage, inspirational (which is very rare nowadays among politicians of both political divide) and then of course Dr mahathir which carries a lot of other things. People have tried to convince me of the merit of Khairy, but so far they are unsucessful.Maybe you could. Malaysian insider is the fishiest portal around. At least with Malaysiakini, we know they want to overthrow BN and who their financiers are - foreign sources and DAP in Penang which has become flushed with cash because developers pressured to "donate" to the party. Recently, I read a fantastic piece written by Insider reporter Eileen Ng.. Such good English and very deep views about Khairy and his politics and future. Yet Eileen is a very mediocre reporter when she was in NST. Garden variety type of reporter who will end her life in PR or something like that because she cannot go beyond he say she say reporting. Our conclusion: the byline hers. The writing by someone who wants to promote the interests of Khairy. Your guess as good as mine. I pity Eileen because everyone laughing at her.